I’m a big fan of art, but sometimes it’s just too nice a day to go trawling through the big museums, even when they house world famous art works. For this reason when I’m in a city I always keep an eye out for public artworks, whether sanctioned monuments or inspired graffiti. I was curious about this exhibition because of the location. Foggy Bottom, where George Washington University, the Watergate, and the Kennedy Center loom large, was once the site of Washington’s light industry. It was the home of glass works, lime kilns, and breweries, a low rent district noted for its smoke and fumes. Thus the quirky moniker. The neighborhood has gone considerably upscale since those early days, of course. But something of its gritty past lingers in the thoughtful art scene that thrives just under the radar. We strolled up and down the narrow streets and mews, musing over the contemporary works of 15 artists. I wasn’t crazy about every one. But all were intriguing. One of the standouts for me was a stainless steel installation titled “Square Wave” by Bill Wood. 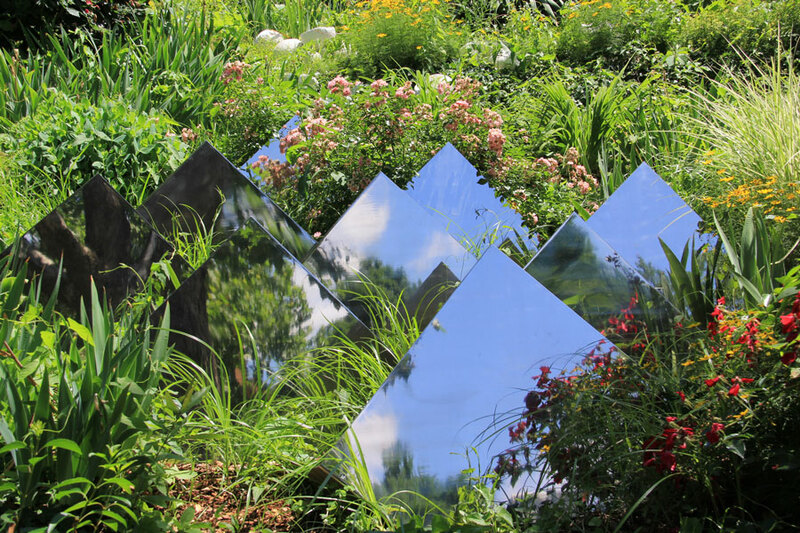 Nine mirrored squares rose out of the garden greenery like a reflective mountain range. As the squares reflected pieces of sky and movement, they also brought to mind the light and energy of a body of water. It was a simple concept, deceptively complex. 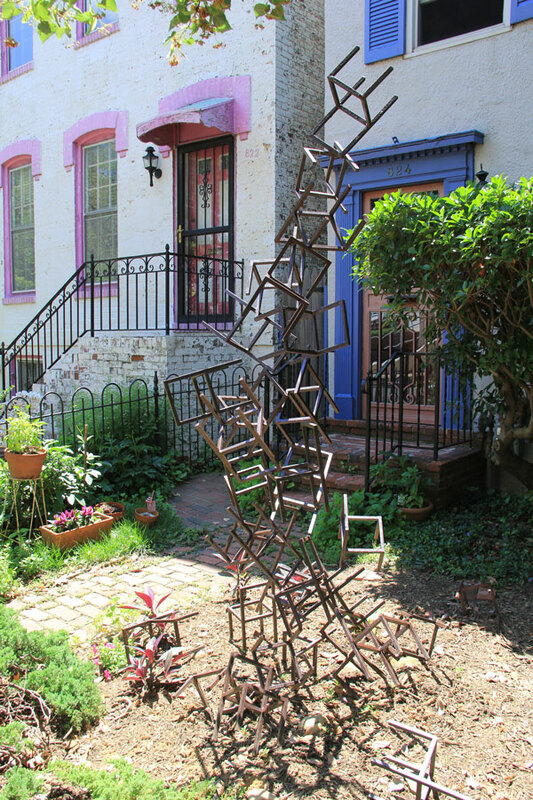 Mimi Frank’s tumble of welded steel chairs recalls the myth of Cassiopeia. This tumble of small welded steel chair frames appears at first glance to be a chaotic spill from the sky. But when you learn the concept behind Frank’s piece — she was inspired by the Greek myth of Cassiopeia, who was punished for her rebellion by being tied to a chair and left to drift through the stars for eternity — the empty chairs resonate with modern issues of gender and freedom. It’s one of Art’s great functions to call attention to important topics, to tip sacred cows, to wake the slumbering conscience. But let’s face it, sometimes all we really want is something pretty to put on the wall. If I had to pick a favorite out of the fifteen works, I wouldn’t have to think twice. Elizabeth Graeber‘s “Garden” made my day. I’ve been an admirer of her work for a while. She’s illustrated funny books, and has a lovely light touch that makes me smile. Her “Garden” will be on display for a few more months on an out of the way wall in Hughes Mews, blooming like the secret prize at the end of a scavenger hunt. 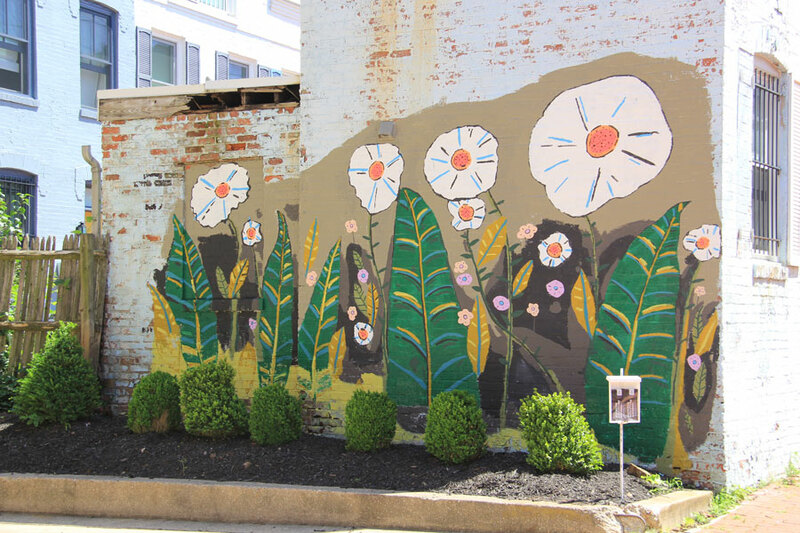 Rain or shine, Eizabeth Graeber’s “Garden” won’t wilt.